Worlds of Fun in Kansas City has successfully branched out from being only a summer destination for my family. Thanks to its new WinterFest, there’s a good reason to consider it now. The holidays at Worlds of Fun is enchanting! 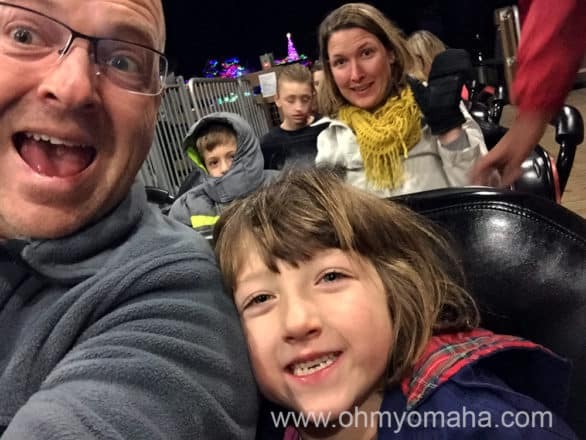 Disclosure: My family’s visit was hosted through a partnership with Blog Meets Brand and Cedar Fair. This post may contain affiliate links. WinterFest at Worlds of Fun runs through Dec. 30, 2017. 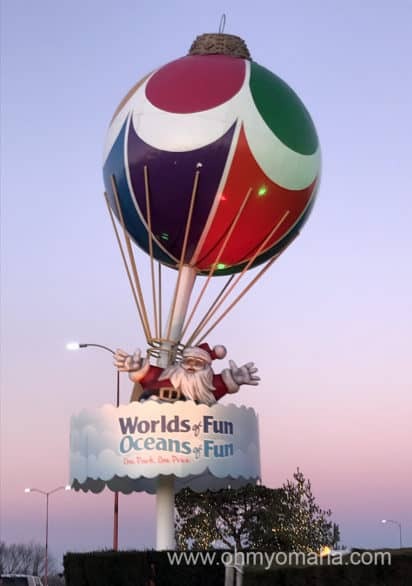 During WinterFest, the amusement park opens in the evening for rides, music, holiday characters, and everything merry. The first year of the event was in 2017, and it looks like it’s gotten bigger and better. 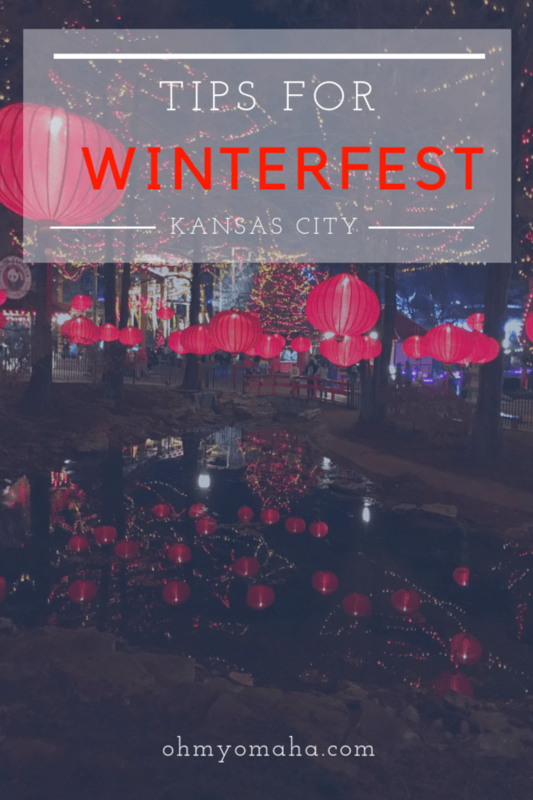 In 2018, Winterfest runs through select nights from Nov. 23 through Dec. 31. Related post: Make a weekend of it! 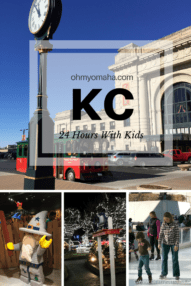 Here are 15+ Fun Things To Do On A KC Christmas Getaway! There’s a lot to see and do, and frankly, one night is not enough. And if you have little ones with you, late nights aren’t a good option. So, here’s how a family visiting with young children make the most of it. 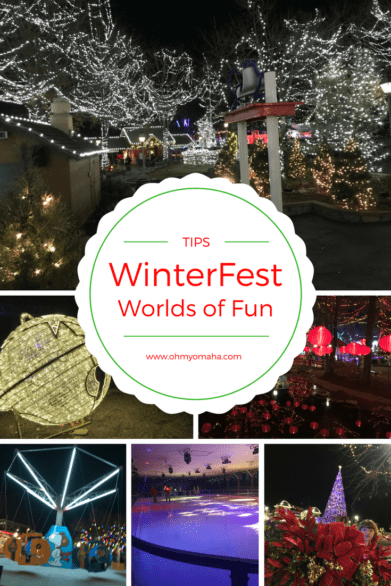 WinterFest starts at either 4 p.m. or 5 p.m. (depending on the night) and ends at 10 p.m. (and midnight on Dec. 31). Five or six hours seems like enough, right? Oh, it never is. Arrive early. You can get into to International Plaza and Das Eishaus Ice Skating at an hour before opening (at least we could last year). The parking lot opens at 3:30 p.m. TIP: Worlds of Fun’s entrance has two right-hand turn lanes, but the night we visited almost everyone lined up on the far right one. Wish we had skipped the line and zipped ahead in that second-to-the-right lane. Your early arrival allows time for family photos with a little daylight, and time to plan out your night. You won’t see lines like a busy summer day, I’m guessing, but if you arrive at 5, expect a line of cars trying to get into park. There are 25 rides open during WinterFest, including rollercoasters like Prowler and Spinning Dragon. We didn’t talk about what rides we wanted to do beforehand, so we spent a good portion of the night looking at our map and wandering around. Most rides in the kids area of the park, Planet Snoopy, were open. This may be great for your family, but if your kids are older, there are far fewer rides that will interest them. We’re not crazy, riding the wooden rollercoaster, Prowler, in November. The good news is, the ride lines were not unbearable, especially for the Prowler. The longest wait was for the ride closest to the entrance. TIP: If you’ve got kids under the age of 8 in your group, head straight for Planet Snoopy for the most rides in one area (and pretty much zero wait time). And I guess it goes without saying: Dress warmly. It gets cold on rollercoasters and the spinning rides in the middle of winter. There are characters throughout the park, and if you just walk around, you’ll find them. No need to go hunt them down…except for The Big Two (Santa and Mrs. Claus). Head over to Scandinavia to find Santa. You’ll find Mrs. Claus in her kitchen in Europa (for an extra fee, you can decorate humongous cookies there). If you’re a Peanuts fan, look for characters over in Planet Snoopy. TIP: If cookie decorating is on your list, expect a line. It went fairly quickly but, just giving you a heads up. We found her! It’s true: Mrs. Claus does bake the best cookies, and they’re about as big as your head. Be on the look out for characters like Jack Frost, the Sugar Plum Fairy, Candy Cane and Jingle Bell throughout WinterFest. Interaction with these festive folks add a fun touch to the night. Jack Frost can even make it snow. 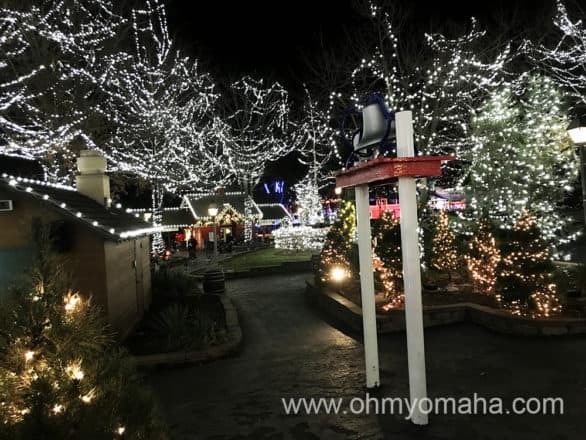 I’ve never seen Worlds of Fun — or any space — as beautifully decorated for the holidays. Walking around makes your feel like a child again. It’s tempting to rush from ride to ride, but you’ll be missing out on the spirit of the event. By the way, if lights are your thing, be sure to ride the train. TIP: For good, overhead views of the park, look to your left as you go up the first hill of Prowler. Artisan Alley – Designed like Christmas markets around the world, you can shop more than 30 local vendors. This was low on my kids’ interest list. Charlie Brown’s Christmas Tree Lot – Walk through a maze of trees and find Peanuts characters at the end for a fun photo opp. Das Eishaus Skating – For an extra fee, you can ice skate under twinkling lights. This is one of the few ice skating rinks I’ve come across that provides skating assistance for beginners (think: A walker on ice). Food & Beverages – Wherever you are in the park, you’ll find some seasonal food and drinks, as well as some usual amusement park fare like pizza, turkey legs and funnel cakes. It wouldn’t be Christmas without hot cocoa, and there’s also spiked drink options for the grownups. TIP: There were lines for hot chocolate throughout the park, except for one place I stumbled upon: Spike’s Cheery Concoctions. It’s not just for the grown-up beverages, you can get cocoa there. Let It Snow – It snows every 15 minutes at Hometown Square in Americana, thanks to Jack Frost. There are also performers and fantastic photo opps like the 300-foot-tall “tree” (AKA the ride SteelHawk). We went on an unseasonably warm weekend and the fake snowfall was a nice touch. Live Shows – There are 10 shows to catch during WinterFest, and I’ll admit, we didn’t seek many of these out. We were on a mission for rides and cookies (and hot cocoa). There’s a Broadway-calibre “Charlie Brown Christmas Spectacular,” “Sounds of the Nativity” with live animals, and everything from jazz to bluegrass and performers on a roving trolley. 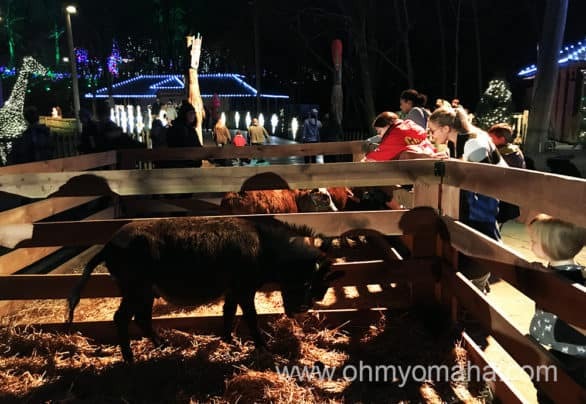 Kids can feed the animals in the Living Nativity (for a few dollars) while singers perform on a nearby stage. There are donkeys, goats, calves, and a few surly camels. We caught the tree lighting ceremony, which is held each night the park is open at 5:30 p.m. Snoopy and about 20 singers and dancers perform a few numbers and then quickly, the tree lights up and then there’s a surprise ending. In my honest opinion, kids didn’t want to wait around for this and if I could do it again, I’d skip it and go on the rides. The tree stays lit the entire night. 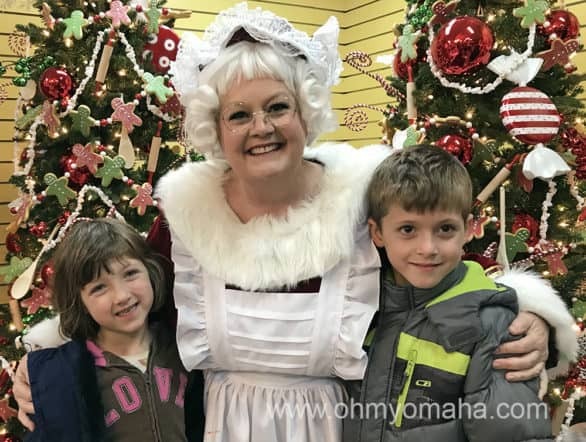 North Pole Post Office – Kids can stop by the post office to write letters to Santa. Nearby, you’ll find Reindeer Roundup with Murray the Moose and others. Don’t go out of your way to find Murray. Sally’s Christmas Crafts – Kids 12 and younger can decorate an ornament to take home or hang on the tree, as well as make cards. Santa sets the mood from the start at the entrance to Worlds of Fun. 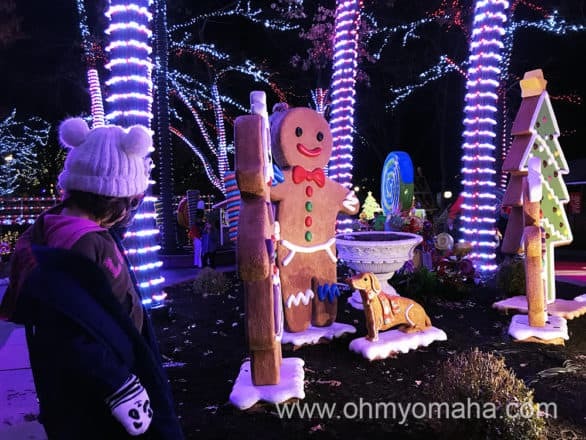 When: Nov. 23 through Dec. 31, 2018; hours vary and the park is open on Fridays through Sundays only through Dec. 17, when it’s open nightly (except for Christmas Eve and Christmas Day, when the park is closed). See the hours here. Where: Worlds of Fun, 4545 Worlds of Fun Ave, Kansas City, Mo. Cost: I haven’t seen the price for 2018 Winterfest Tickets. Last year they were $25 (or a bit more at the gate); the all-inclusive ticket was $45 (plus fees & taxes) online, and that included admission, parking, a single meal deal, and a souvenir mug. Ice skating was $15, and the cookie decorating with Mrs. Claus was $14 (includes four cookies). You’ll want to check this worldsoffun.com for ticket information. It’s almost always a better idea to buy tickets in advance to pay the lowest fee and to avoid lines for tickets. Find Kansas City hotels near Worlds of Fun and read reviews on TripAdviser! I sooo agree! You just can’t do it all in one night. I want to go back! What a fun event! I could totally go back again for another night and not repeat anything we did the first time.